Spray 5- to 6-quart slow cooker with cooking spray. In 2-quart saucepan, heat heavy cream, garlic, 1 tablespoon thyme leaves, the salt, pepper and nutmeg just to simmering over medium heat. Remove from heat. Add one-third of the sliced potatoes in overlapping pattern to bottom of slow cooker. Pour 1 cup cream mixture over potatoes; sprinkle with 1/2 cup of the Cheddar cheese. Repeat twice to create 3 total layers of potatoes, cream and cheese. Cover; cook on High heat setting 4 to 5 hours or until potatoes are fork-tender. 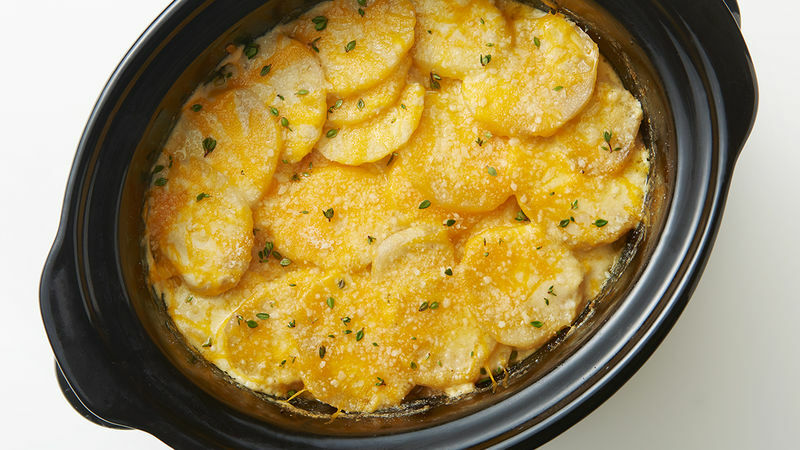 Turn off slow cooker, and sprinkle top of potatoes with remaining 1/2 cup Cheddar cheese and the Parmesan cheese. Cover; let stand 5 to 7 minutes or until cheese is melted. Uncover; let stand 10 minutes longer to allow mixture to thicken. Sprinkle with remaining 1 teaspoon thyme leaves just before serving. Use a mandoline slicer for uniformly thin potato slices, if desired. Each slow cooker varies in performance. Check the potatoes at the minimum time to check for doneness to prevent overcooking.